I love taking pictures of nature, even if my kiddos aren’t in the shot. Taking pictures helps me slow down, really focus on something and see beauty where I might not otherwise. It helps me connect with nature. Encouraging kids to take photographs gives them a chance to do the same thing. The bonus: You get to see the world through their eyes. 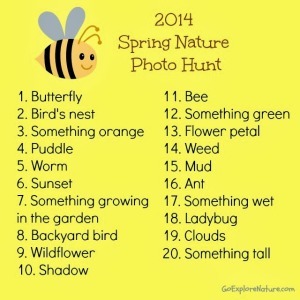 With that in mind, I’m pleased to announce that the 2014 Spring Nature Photo Hunt is here! I’ve come up with 20 things you and your kiddos can hunt for outside this season. Find an item, snap a picture and check the item off your list. 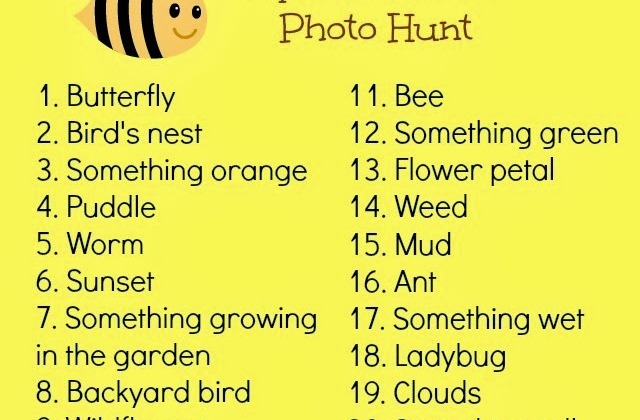 To make it even easier, I’ve created a free Spring Nature Photo Hunt list that you can print out and post somewhere you’ll see every day. Most items can be found in your own backyard or neighborhood; others might be spotted during a local nature adventure. You may choose to complete the spring nature photo hunt all at once or play all season long. However you choose to participate, what really matters is that you and your kiddos get outside exploring nature this season! I’ll be sharing our pictures on Facebook if you’d like to follow along and see what we’re up to. LOVE THIS! Thank you for making it easy to print!